In 1930, when I was four years old, my parents bought a house in Droylsden. It was in a short cul-de-sac called Wordsworth Avenue, which was the first row of houses to be built of a huge estate that was being developed by a man called William Chappell. I lived there until my work took me away in late 1949 - give or take a little National Service - so the area forms the scene of my childhood and teenage. Taken for granted at the time, I realised when my own children were growing up that I had enjoyed a very privileged play area as a child, and one which must rank as outstanding. Droylsden was not part of Manchester at that time, but was an old urban district within Lancashire, popularly known to the inhabitants of Manchester proper as 'The Silly Country'. Most of the surrounding land was open countryside. Droylsden was little more than a cluster of buildings and side-streets strung out along the cross-roads between Market Street and the main Manchester Road - the A 667 - for a mile or two. Virtually dominating the place were two waterways - the Hollinwood Branch of the Ashton Canal, and the valley of the River Medlock. They ran quite close together. Now they are both constituents of the Daisy Nook Country Park. In my day they were our free-for-all playground. In the early 1930s the canal presented a very different aspect from that which can be seen now. Leaving Fairfield basin and going under the Manchester Road bridge, Christy's towel mill was positioned so that it occupied the right angle between the left hand bank and Ashton New Road. A little further on the Courtauld works stood on the right hand bank. Next came Greenside Lane bridge, and then almost immediately, the Droylsden gas works on the left hand bank. The canal along this stretch was gloomy, over-shadowed by the high gas works wall and buildings on the right-hand bank. This was exceptional; it generally had an open and attractive appearance. This area is all houses now. 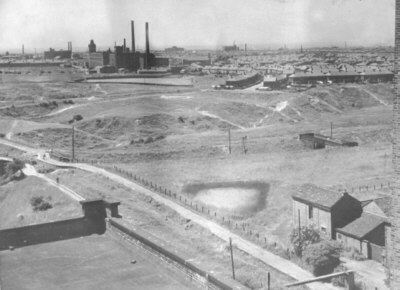 At the end of the gas works there was a vacant piece of land on the left bank, on which St. Stephen's church and school were soon to be built. Then came the Clifford swing bridge carrying Sunnyside Road over the canal. From here on the canal was in open country on the left bank. On the right bank were two very prominent mills - Saxon Mill and Lumb Mill, as well as a sweet factory and a disused brickworks. After this, it was all open country to Crime Lake, after which the canal dived into the built-up area towards Hollinwood. The canal was a coal canal serving these mills, the gasworks and other users. Initially it had carried coal as far as Manchester, but the collieries along the stretch from Lumb Mill to Hollinwood had closed, so traffic no longer came from that direction, but came the other way from Bradford and Snipe collieries. These two collieries lay on the main Ashton Canal. All the boats were wooden, which is a bit surprising, since the longevity and robustness of iron and steel boats had won the day in most places. They were horse drawn. The seeds of decay were beginning to be visible. A few yards from the lock-keeper's house at the Fairfield basin there were two abandoned boats rotting away, and in the mid-1930s subsidence to the canal bank caused a cofferdam to be erected at the Cinderland bridge, a few hundred yards beyond Lumb Mill, so that through traffic to Hollinwood was no longer possible. The construction consisted of planks placed in grooves set in the stonework of the bridge abutment. This feature was obviously intended to enable the section to be isolated for maintenance, but the cofferdam was never removed again. As I never saw a boat beyond Lumb mill in all the time I lived in the area, this was clearly no loss to trade, even though it is regrettable, as it virtually ensured the loss of this waterway. The water in the isolated section from Cinderland bridge to the first lock [I believe it was officially lock number 19 on the Ashton Canal] fell progressively over the following years as subsidence increased, but it never dried out. Some accounts have this cofferdam installed in 1955, but I clearly remember that it was in place before the war. As I have not travelled this particular part of the canal since 1950, the date must be before that time. Saxon Mill and Lumb Mill and their relationship to the landscape are worth describing. Two small streams, which probably had their origins on Ashton Moss, originally flowed down two cloughs, Pinch Clough and Lumb Clough, joining together in Bell Clough, and thence into the Medlock. These streams were culverted where they passed under the canal at the time it was built. After that point they reverted to nature, and both cloughs were in an uncultivated state. Pinch Clough was a favourite playground. From the point where Sunnyside Road crossed the canal on the Clifford swing bridge, it was only about 100 metres away, running parallel with the road at first, and then diverging away from it. Saxon Mill, which straddled its original course, had a cooling pond [mill lodge], and what little water was discharged from this went into the canal, leaving the Pinch stream clear and unpolluted. A disused light narrow gauge tramway ran down to within a few yards of Sunnyside Road, crossing the clough on a trestle bridge. This was believed to have been used to deliver peat to the canal during World War I, but I never saw any proof of this. A couple of tipper trucks had been abandoned with the tramway, and the combination was irresistible to small boys. We committed many a Wild West train hold-up on this excellent playground until the developer partly filled the clough and built houses on the area. Lumb Mill discharged hot water directly from the condensers of its steam engine into the Lumb stream. This thermal pollution caused algal growth in the stream in summer, which we found objectionable, so Lumb Clough was not as popular as Pinch Clough for hunting Indians in the undergrowth. After the two streams combined in Bell Clough there was no further sign of algae. The combined streams were then crossed by the Lancashire-Yorkshire Railway embankment, under which they were again culverted. The River Medlock, which the combined streams joined at Bell Clough, also ran clear and free from pollution. It had not always been so, but the Park Bridge coal mine and ironworks, the causes of the pollution, had closed down in the 1920s, and the river was as clean as it is today. Pollution started at Clayton Bridge, where a small sewage works and a pig farm combined to make it unwholesome. However, no wild life had returned to the upper reaches of the river, as it was impossible for fresh life to ascend from the polluted River Irwell, which the Medlock joins at Castlefield in Manchester. Incidentally, Park Bridge ironworks had the misfortune to supply the rivets for the Titanic. The quality of these has been the subject of serious criticism by modern investigators of the hull damage to the ship. My first exploration of both the canal and the Medlock valley was brought about by my maternal grandfather. Born in 1860, he lived in his retirement on Greenside Lane, and went out walking the local countryside regularly until the year before his death in 1938. From about the age of five he took me with him if I was not in school and the weather was fine. These walks averaged two or three miles, and never took us further than Daisy Nook. The Waterhouses in Daisy Nook were still standing and inhabited at this time, but they were obviously poor places to live. The buildings were small, primitive and centuries old, and I clearly remember that their front doors were of the 'stable door' variety. Condemned by the local authority as unfit for habitation, they were demolished after a year or two. I have wondered whether they would have been preserved because of their age if they had still been standing when the National Trust took over the site. An annual fair was held alongside the river at Daisy Nook. The next stage in the development of my acquaintance with the canal was the acquisition of a boy-sized bicycle for Christmas when I was about seven. This extended my range considerably. Myself and a friend called Derek Goodwin used our bikes much as children now use mountain bikes. 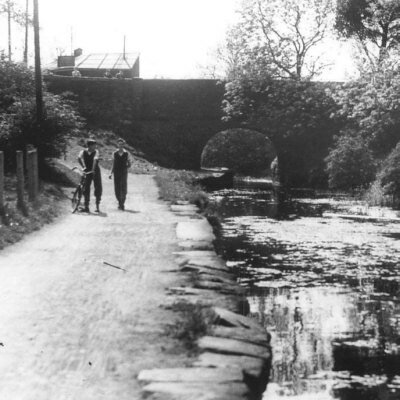 The canal tow path and the footpaths into Medlock Vale were our every-day haunts. Ventures as far as Crime Lake were now commonplace, and our range extended to the first real hill of the Pennines, Hartshead Pike, at the foot of which flows the River Medlock. However, I do not remember us going beyond Crime Lake along the canal tow path. We did travel in the opposite direction to Fairfield Junction, and up the main canal to Ashton [where there was a good model shop] and down towards Manchester into Philips Park. This latter was also accessible along the bank of the Medlock from Clayton Bridge. The river was singularly unattractive here, as it was lined with slag heaps and detritus from the early Industrial Revolution. The slag heaps did, nevertheless enable us to exercise our unorthodox skills at riding our bikes over rough terrain. When I graduated to secondary school and acquired a full-size cycle my frequenting of the area towards Crime Lake increased. It was here I first learned to row a boat. An elderly man whose name I never knew owned the boats, which he carefully scraped down and re-varnished each winter. Apart from the usual river boats, he had three single-scull sports rowing shells. These were great fun if one was alone, but if accompanied by a young lady [I started young] the more staid river boats were the order of the day. The other use to which I put the tow path was as a sports training ground. My sports master at the secondary school I attended from 1936 had quickly spotted something about me that I had failed to observe - that I was a budding long and medium distance runner. The bike now tended to stay at home as I ran up to Crime Lake as part of my training. Eventually, I won a few trophies for the mile before I became too old to enter as a schoolboy. Had it not been for my frequent training ventures on the canal tow path, I would probably have never developed the stamina. A new leisure use of the canal was found by a few of us during the war. We had been deprived of our ice skating facilities by the war, as the Derby Street ice rink was taken over for food storage. The quality of the ice on the canal in the open countryside was usually good in periods of prolonged frost provided there was no snow, and it froze good and hard in winter for periods of a week or two at a time at this elevation. We were not stupid about it; we only ventured on the ice when it was at least three inches thick and we avoided areas near bridges. It had an advantage over an ice rink - it was free. During the early years of the war the tow paths of the Ashton Canal and the Rochdale Canal served myself and an aunt in a very different capacity. Manchester suffered a severe blitz on the nights of the 23rd and 24th of December 1940, 500 people being killed. My aunt was a teacher at Varley Street infants school in Manchester, and she received an SOS saying that the area around the school had been badly bombed, and asking for help to evacuate the surviving children. I had been nominated as a boy messenger for the ARP by my school, so I was accredited for ARP work. She quickly rounded me up to assist and we set off to penetrate the bombed areas on our bikes. It quickly transpired that the main A667 into Manchester was completely blocked by an unexploded land mine at North Road, and attempts to by-pass it on side streets led to other 'Keep Out' notices due to unexploded bombs. We took to the Ashton Canal tow path in Clayton, and then went across Grey Mare Lane and Forge Lane, [now renamed Alan Turing Way] to the Rochdale Canal, which we knew passed the end of Varley Street. We made it. The events of the following day are best forgotten. We were eventually free to return home. We immediately found that the canal tow paths were now barred. The ARP had eventually got round to checking them, and found that the canals, too, had their share of suspected unexploded ordnance along them, although we had observed no bomb damage to the canals themselves on our way down. Fortunately, many of the roads had now been re-opened, so we got back home in time for a very miserable Christmas dinner. There was so much shrapnel from the anti-aircraft guns lying on the ground that we suffered three punctures between us en route. Fortunately I had a good repair outfit in my saddlebag. No account of the canal would be complete without reference to its wild life. 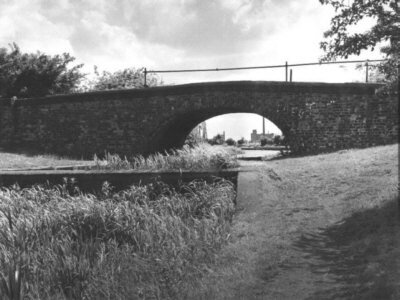 The canal company sold process water to places like the Clayton Analine chemical works, and to this end they ensured that the water was clean, even if it did not perhaps reach potable standards. Consequently, it teamed with fish and other wild life. 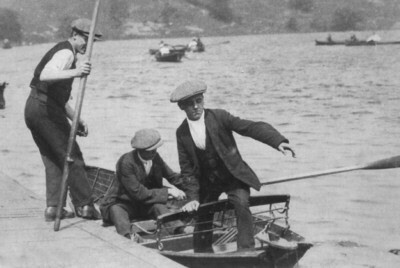 A coarse fishing license was needed to fish for carp, which were plentiful. As small boys, we avoided confrontation with the water bailiff by restricting our pray to sticklebacks, newts, water snails and fresh water crayfish. We spurned frogs as too common. The crayfish were rare in most areas, but they were relatively plentiful close to the end of the cutting known as the Dark Tunnel. The local newsagent stocked a line of small fishing nets on canes which fulfilled our needs. The sticklebacks, snails and newts were used to populate our personal aquaria, as were a selection of weeds dredged out of the canal. Superstition had it that a combination of weed and snails would maintain a healthy aquarium. The crayfish were caught merely for fun and thrown back. We were well aware of what would happen if we let them get at our 'pet' fish. Mortality was still high in spite of our efforts, and replacements were needed at regular intervals. The newts, clever blighters, always seemed to escape, in spite of being pampered with ants' eggs. There was other wild life to be seen. Waterhens were plentiful, but they wisely always remained on the side of the canal furthest from the tow path. This area had a narrow reed bed along it which provided cover for the birds. Unfortunately, there were no swans or ducks. At the right time of year May flies abounded, as did Dragon flies and, prettiest of all, Damsel flies. These swarmed in large numbers over the water. They came in two bright colours - blue and yellow. The Damsel flies and May flies had very short seasons of a few days, but the Dragon flies were to be seen over a much longer period of time. The May flies and Damsel flies were the prey of both the fish and the swallows. The Dragon flies were the prey of larger birds. Many a modern parent reading this will be horrified at the idea of children wandering loose over miles of countryside unsupervised, but it was a different world. We felt absolutely safe, and the results bore us out, and justified the freedom that our parents allowed. Of a group of at least fifty children from the estate who regularly frequented these areas, I never heard of a single serious accident. True, my sister, when she was allowed to join in our masculine pursuits, often ended up with wet feet [she should have learned to jump further], and there were a few grazes and the odd bruise. But that was the worst that happened. Who needed Outward Bound when we had this facility on our doorstep? The popularity of the present country park is well merited, but it was more fun when nothing was regulated, and if you wanted to fall in the river, you were free to do so!